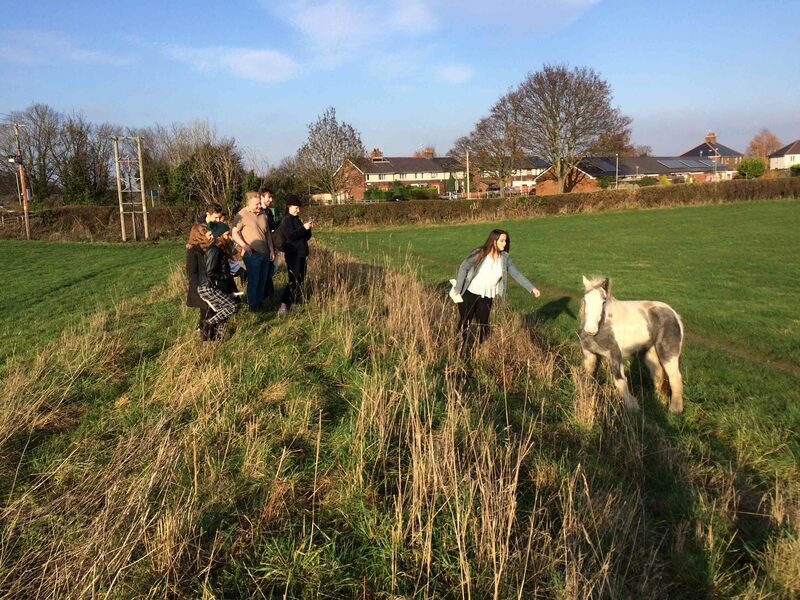 Where can you visit Wat’s Dyke in Wrexham? Re-posted from Howard’s Archaeodeath blog-post. Despite being a shorter monument than Offa’s Dyke, because its course navigates lower elevations, there are more situations where it navigates modern conurbations. 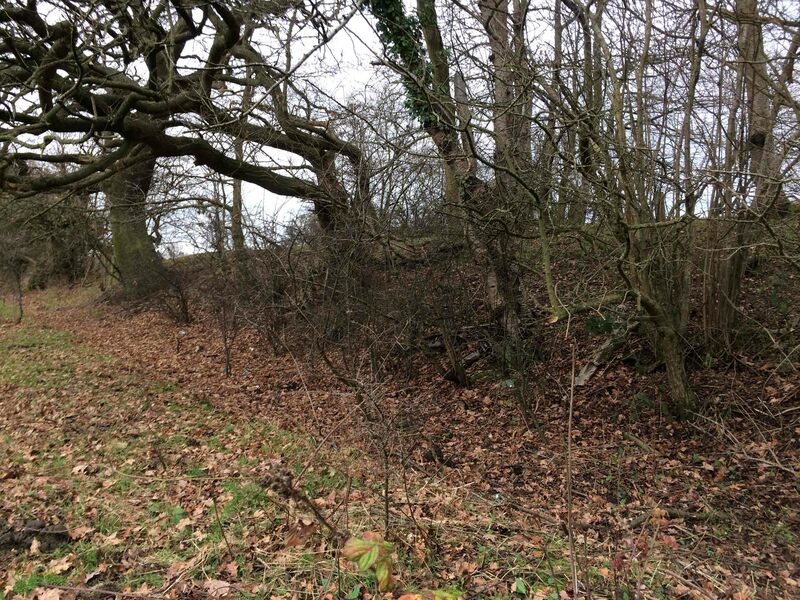 This is a challenge for the preservation of Wat’s Dyke, but offers a host of opportunities to engage large numbers of people with this significant early medieval monument. 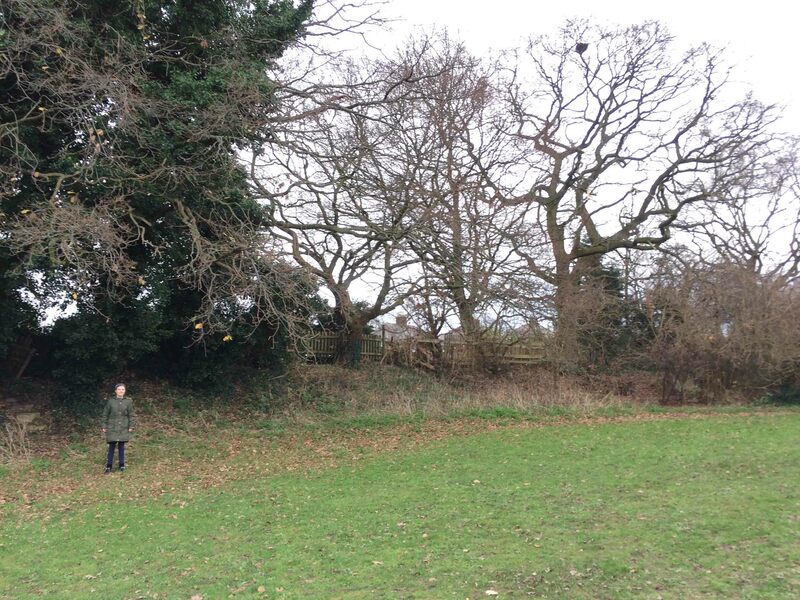 Sadly, for most people living in suburban and urban areas, Wat’s Dyke is an invisible giant. 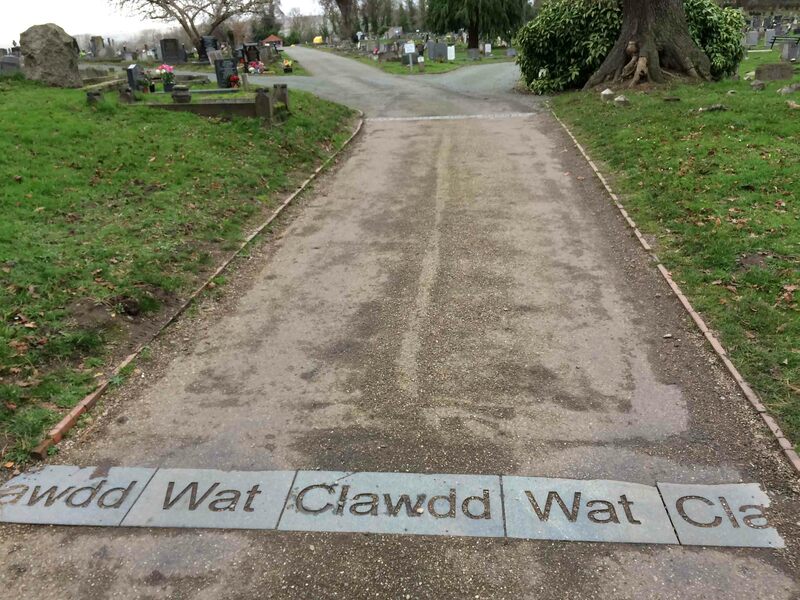 How many Wrexham residents know how and where to spot their oldest standing monument – the 1,200-year-old Wat’s Dyke -where to runs from the Alyn at #Pandy through #Rhosddu to #Wrexham and #Erddig? @wrexham #watsdyke @Project_Eliseg? 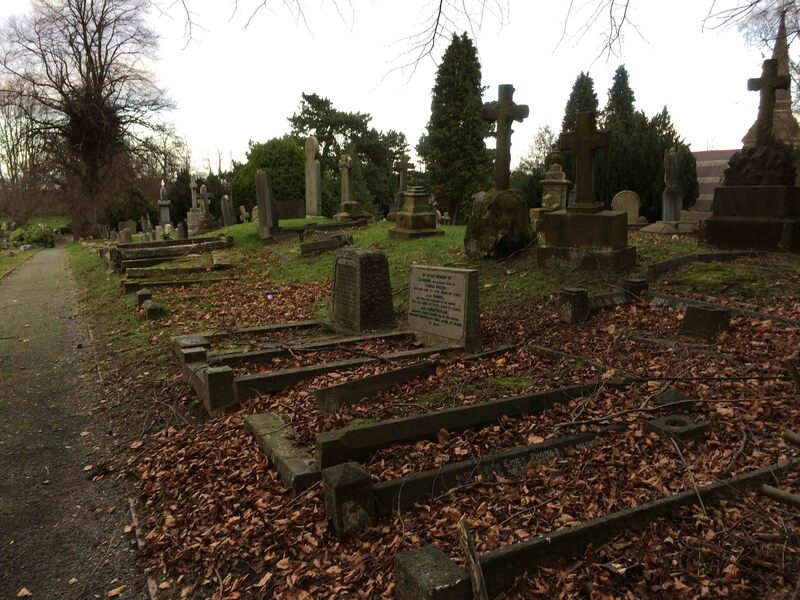 I also mentioned some of my blog-posts on this Archaeodeath blog. But what about a guide to where Wat’s Dyke runs? Surely I could direct them to something already published and coherent? Sadly no! Detailed Ordnance Survey maps will help the walker find sections of the monument, sure. However, they aren’t fully reliable and appropriately annotated for many sections. 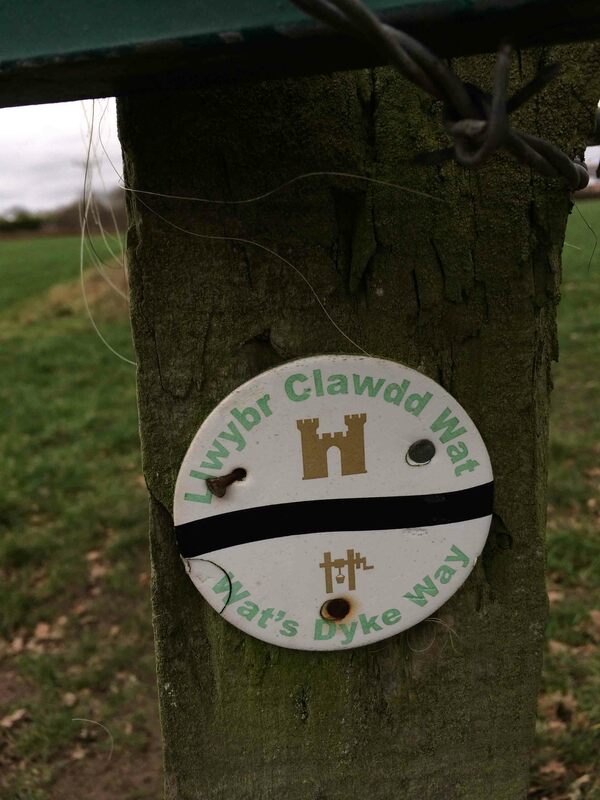 The Wat’s Dyke Way Heritage Trail is useful, but has no information about the monument itself along the course. Coflein will allow you to find details on individual points along its course, but not about how it looks and how publicly accessible the locations are. 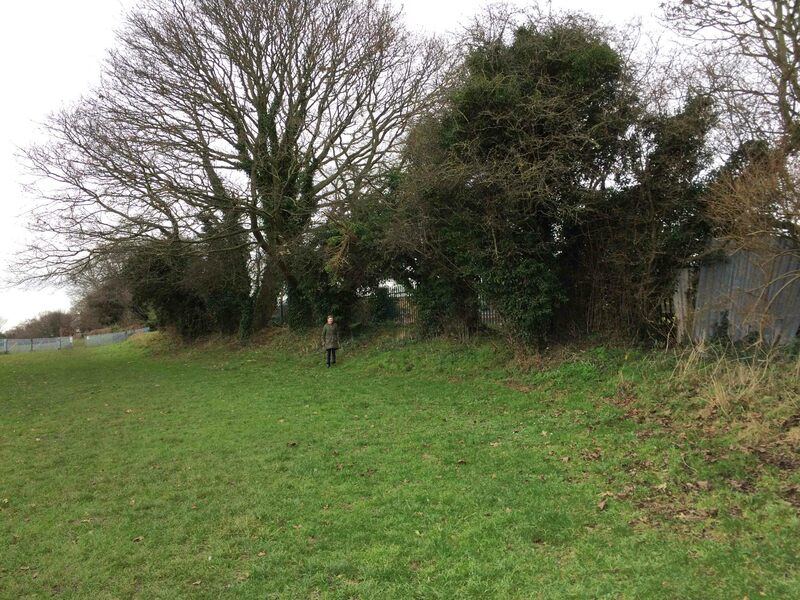 More/different details can be found on Archwilio – the online Historic Environment Record hosted by the Welsh Trusts: it gives you a line of points where Wat’s Dyke can be located, and details for each point. However, the ‘dots’ don’t always match up with the stretches of the monument that remain extant. Entries sometimes contain no information, and some sections of the dyke have no description. 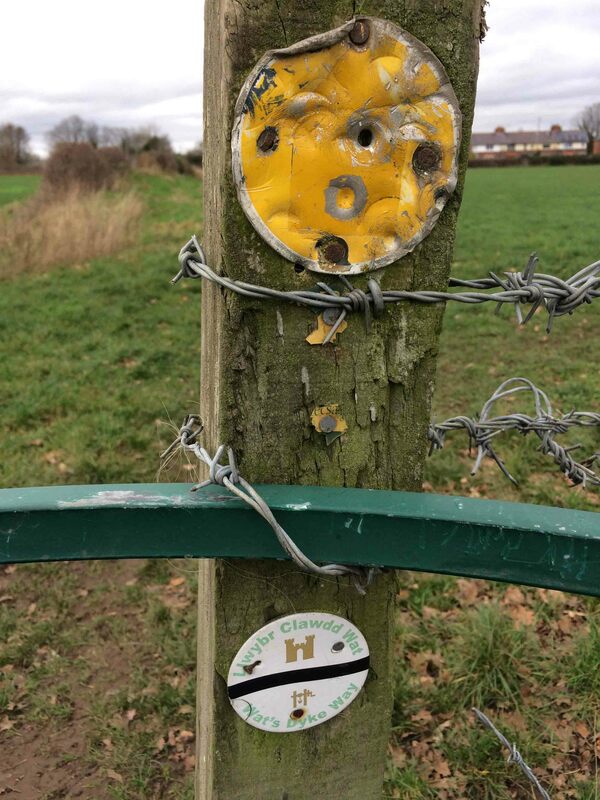 Again, access issues aren’t easy to match up with public rights of way, although a combination of Coflein/Archwilio with an OS map will get you to most locations. Still, none of these are designed as public-facing and user-friendly for someone wanting to explore this monument in their neighbourhood. Moreover, the only published and easy-to-appreciate maps are those on the macro-scale: charting the dyke’s overall course in relation to the broader landscape. 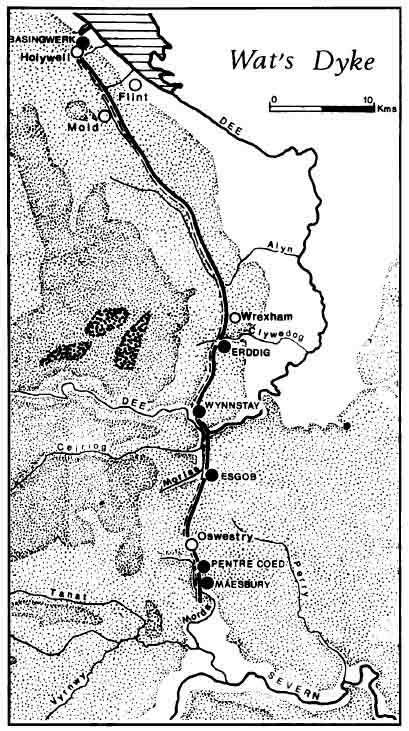 For instance, Fox’s 1955 Archaeologia Cambrensis map shows Wat’s Dyke from Dee to Morda, with the sections where it survives as an earthwork marked clearly in relation to rivers and in relation to steep river valleys. He also marks areas where he postulates it crossed cultivated land around Wrexham, Ruabon, Gobowen and Oswestry. In 1997, Margaret Worthington produced a different version, focusing on the topography more. However, it is not detailed enough to let anyone navigate the precise route of Wat’s Dyke in relation to the existing landscape. These are not designed for people to visit the monument and the scale prevents this in any case. So how do we expect laypersons to visit and appreciate Britain’s second-longest early medieval linear earthwork if we cannot even put up a coherent heritage trail and heritage boards, or even web resources to guide people with a simple map?? 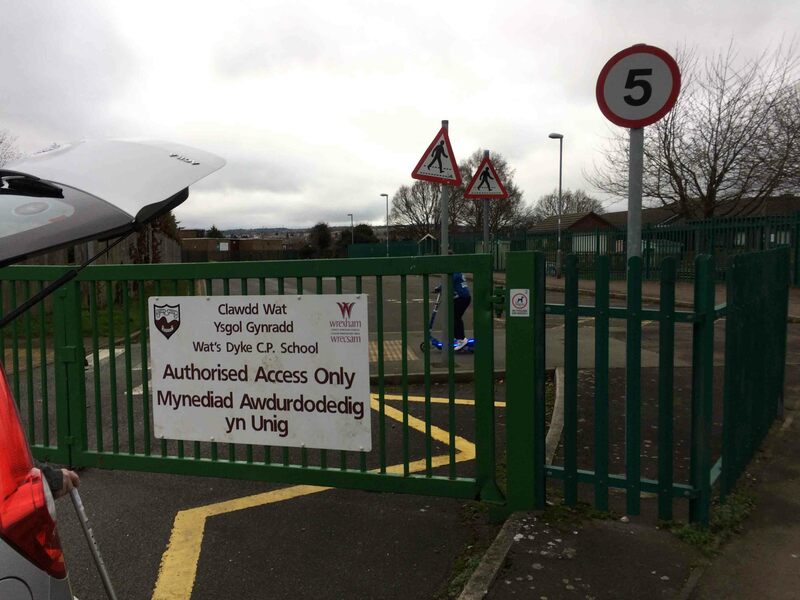 This is especially important for Wrexham, where there is commemorated in buildings and a road – Wat’s Dyke Primary School, Wat’s Dyke Way – and where the monument runs through the western side of the town from Bryn Alyn hillfort and Pandy down to the Clywedog and Erddig Hall. In this area, while heavily damaged and lost in many places due to post-medieval/industrial activities and modern housing, it affords tens of thousands of people with the ready opportunity to visit a section viewable from public accessible land on their doorstep. 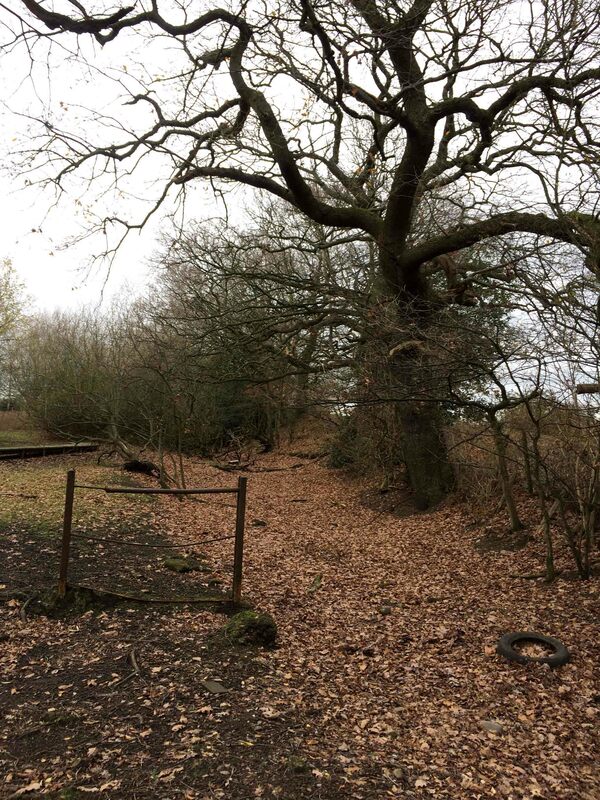 No matter how humble, damaged and overgrown it might be, surely there must be easy digital resources and apps to help facilitate engagement with it? Even Erddig NT have nothing coherent and up-to-date to say about it, and the heritage board at Erddig castle bears out-of-date information despite being new. 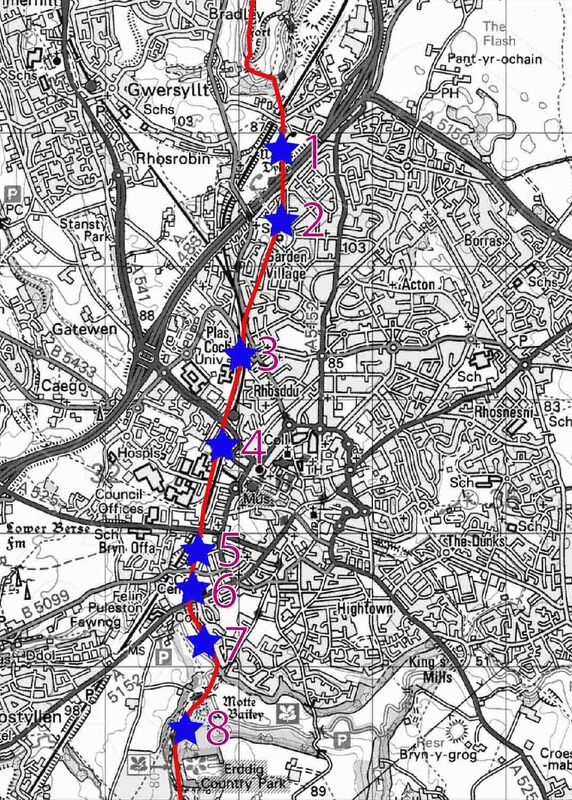 Something far more slick could be developed, but let me sketch a rough attempt to answer the question ‘Where can I visit Wat’s Dyke in Wrexham’, focusing on 8 locations in the suburbs of town, and of course focusing on publicly accessible locations. Let’s take each location in turn from North to South, identifying access, what you can see, and what it tells us, as well as links to previous blog-posts about each. The dyke is badly damaged by quarrying and agricultural activitity. Present for c150m to north of A483 road. Further to north line marked by hedgebank. Remains consist of bank max 1.3m high, hollow to west. Southern end of this section of Dyke cut through by the building of the Wrexham by-pass. Via a footpath running south from Plas Action Road just after the Bluebell Estate and before it heads west over the railway line, one can traverse a good stretch of Wat’s Dyke as far as the A483. The ditch is largely filled in, and the bank denuded significantly, as the Dyke forms the boundary of post-medieval fields. However, don’t give up (as I did before) until you hit the bank of the A483 where the dyke has been destroyed for some distance by the road-building until one can see it again on the south-side of Ty Gwyn Lane (see point 2, below). This is because, to the south, close to the A483, the bank survives increasingly better, until it is almost 2m high. Furthermore, at the southernmost part of this section, a gully to its west is large and wide, implying the presence of a silted up ditch. What’s the dyke doing here? It’s crossing flat ground with good views westwards, between the Alyn and Clywedog. There is no Archwilio description of this section in Garden Village. On the south side of the A483, from Ty Gwyn Lane up to Wat’s Dyke Primary School, there is a good section. 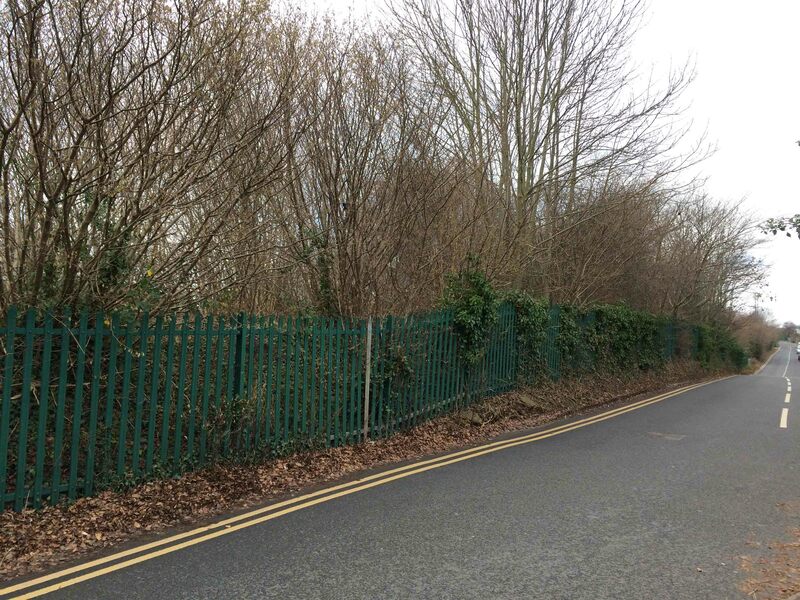 You can park on Ty Gwyn Lane, or else on Wat’s Dyke Way and then walk into the grassed area kept clear of houses and explore the dyke. 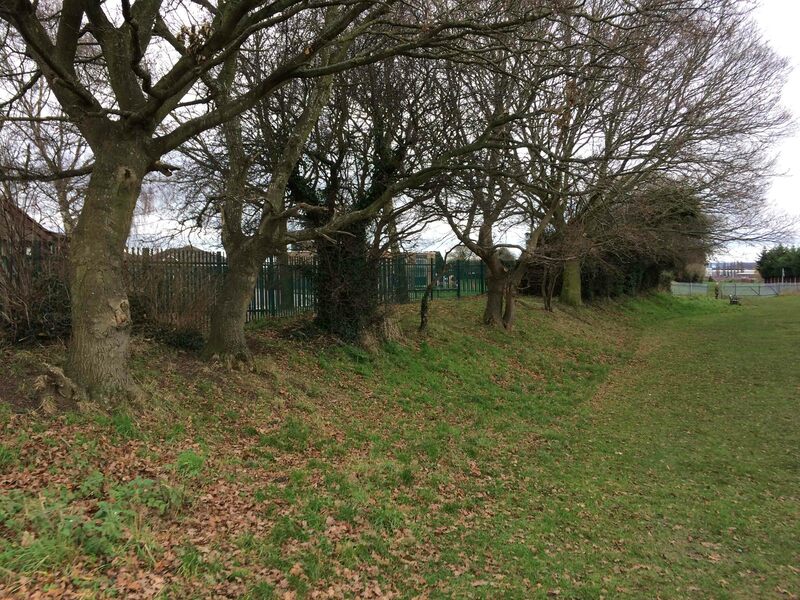 The bank again varies in height, and is higher to the north, beside Ty Gwyn Lane.The ditch does actually survive as a wide, low depression, particularly at the top of the hill at the southern end of this section, beside Wat’s Dyke Primary School. 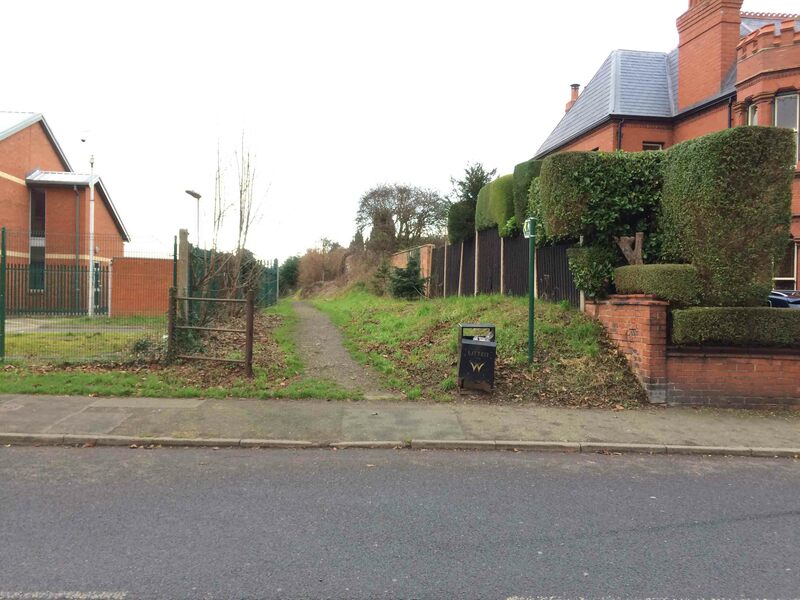 South of the primary school, the Dyke can be seen for a short stretch but then disappears beneath the back property boundaries of houses. The dyke is here navigating a modest but significant high-point between the Alyn and Clywedog. Its precise route optimises visibility west and maintains visual communication eastwards. 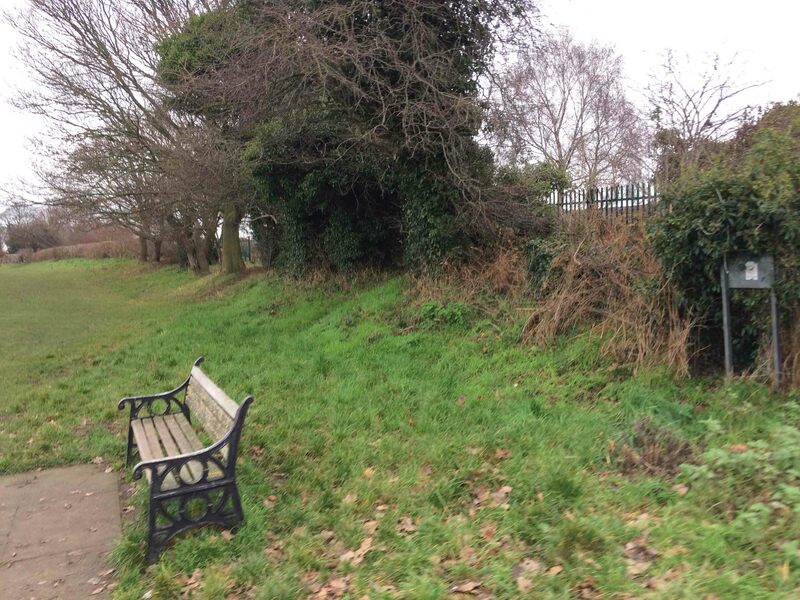 Two sections of Wat’s Dyke bounded to the west by Crispin Lane, which probably overlies the original western ditch. Large, impressive and well-preserved stretches of upstanding dyke. Northern section (SJ33015128 to SJ33005122) some 80m long, 10m wide and 1.5m in height. The eastern face and top of the monument are obscured by dumped material, probably associated with the construction of the adjoining railway sidings. Southern section some 75m long and 8m wide, height increasing from 1m at southern end (SJ32975111) to 2m at northern terminal (SJ32995117). For approximately 60m of its length, the eastern face has been artificially scarped, possibly as a result of the construction of the adjoining railway sidings (Cadw, 2003). In this area, the Dyke is running over flat/modestly sloping down before it descends to the Clywedog. 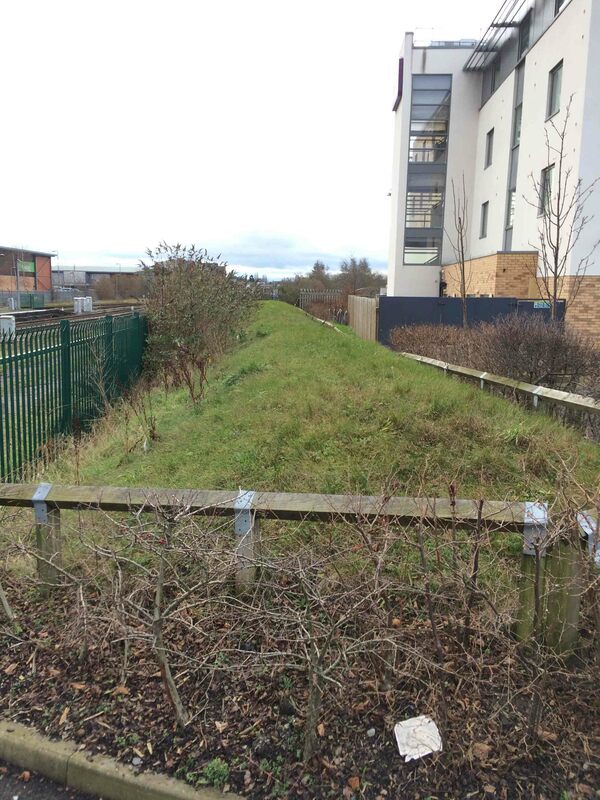 Park in the Premier Inn car park, or else walk in from the Mold Road, and between the new hotel (2012) and the 19th-century railway line is a reconstructed section of Wat’s Dyke, displayed but without signage, and relocated following archaeological excavation (Grant pers. comm.). Named by me the Cambria Dyke because of its proximity to Coleg Cambria. Park at Morrisons or beside Bellvue Park, and walk along Ruthin Road. From the east side of the rise where the road crosses the railway bridge, one can look down over a property boundary between allotments and houses (to the east of it) and a public footpath heading south to Bersham Road, with Coleg Cambria’s car park on the western side. This is Wat’s Dyke! The footpath follows the former line of the ditch. 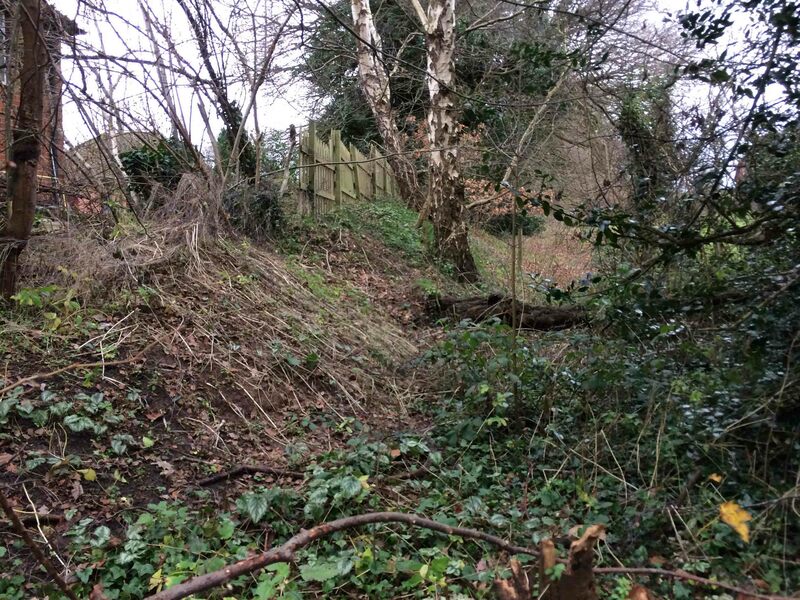 At many places the bank has been damaged and disturbed by 19th-century walling and 20th-century fencing, but just south of Ruthin Road the bank is almost 2m high. In this section, and Wrexham cemetery, the dyke is approaching the Clywedog valley, so that it hits a prominent point before negotiating its norther side. 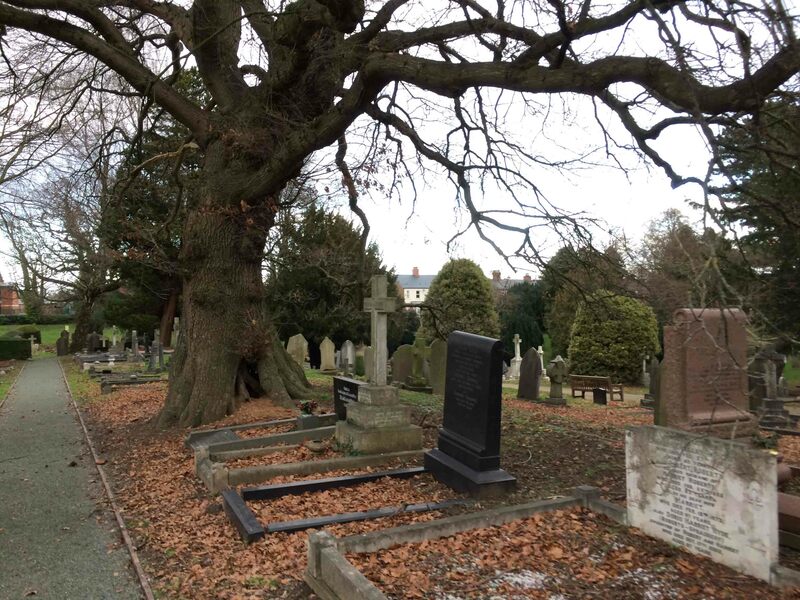 Park in or beside Wrexham cemetery and visit Wat’s Dyke within its grounds! 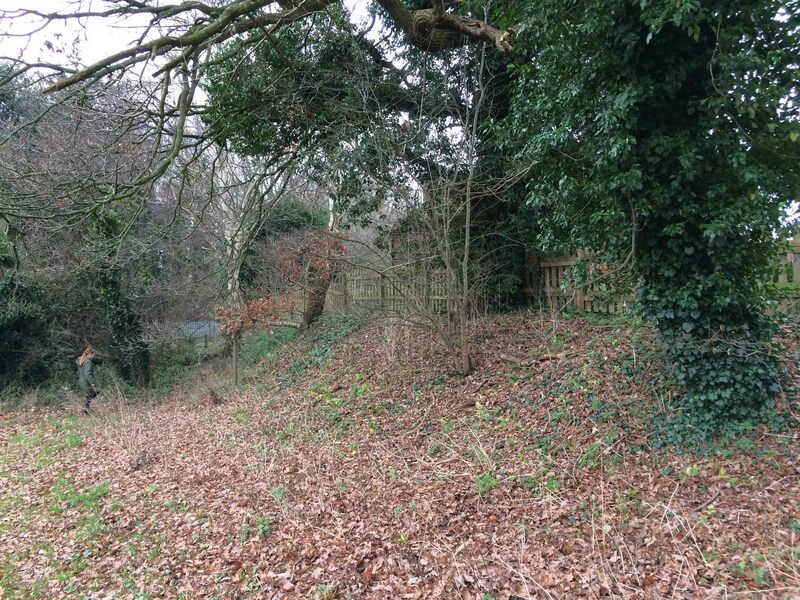 The ditch has gone but the bank survives as a low earthwork running south from Bersham Road to the top of the hill before the cutting created by the Ruabon Road breaks it off. 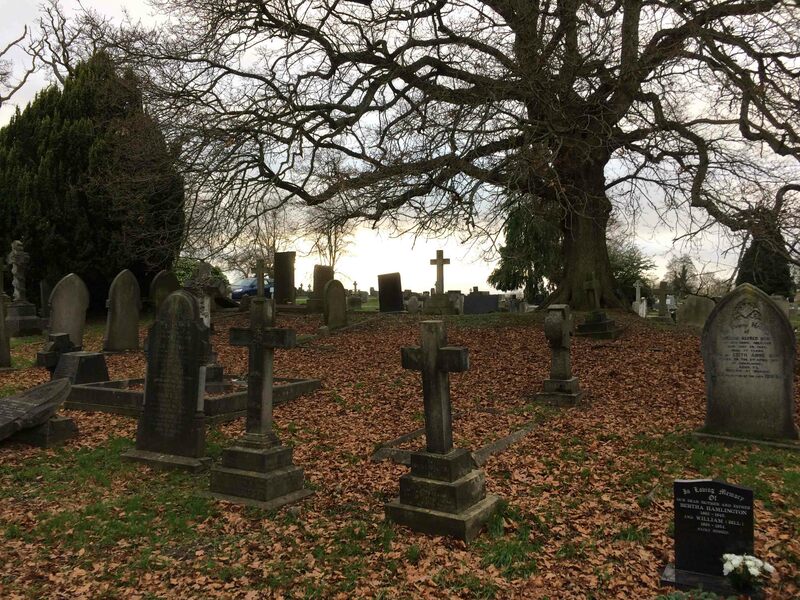 The dyke lacks a separate PRN within the cemetery grounds, where it is discernible, if covered with 19th-century graves. Indeed, this is the only place where its edges are marked by heritage lines in the two driveways in the cemetery that bisect its line. 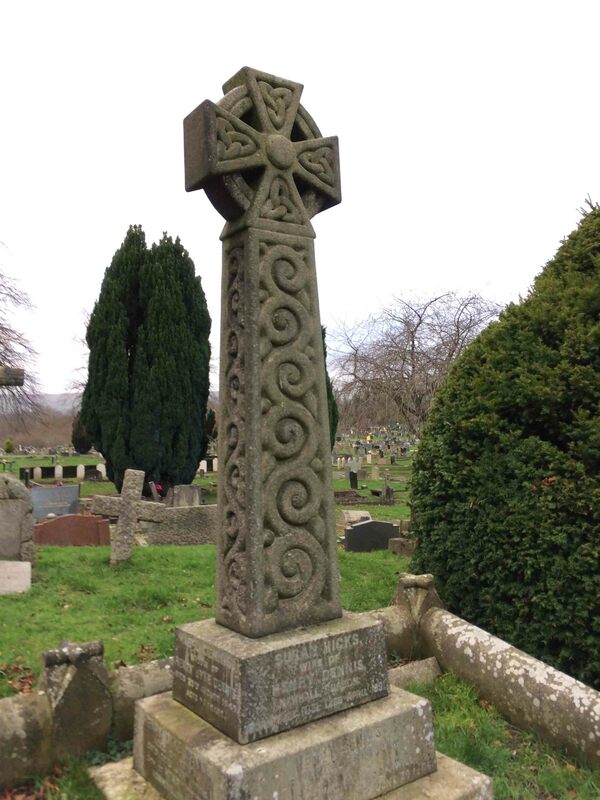 Notably, the Welsh is on the ‘Mercian’ (east) side’, the English on the ‘Welsh’ (west) side of the monument! Looking N along Wat’s Dyke, covered in graves! I was struck by the large number of early medieval-inspired graves of late 19th century date overlaying the early medieval monument! The funerary landscape incorporating such an important ancient monument is a rare thing. 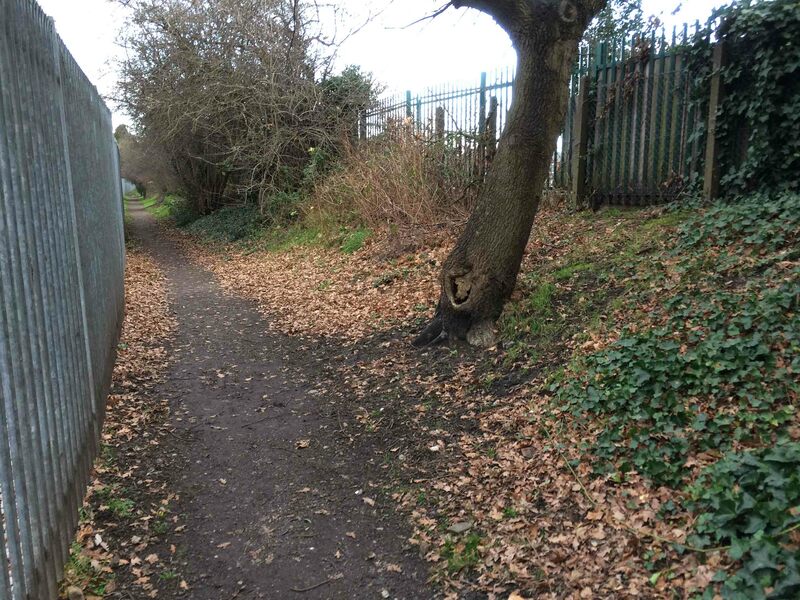 This section of the Dyke is only separated a short distance from the Cemetery Dyke (6) by the cutting for the Ruabon Road. Indeed, one can see the Cemetery Dyke in profile from the location where the Court Wood Dyke begins. To visit, walk in from Wrexham along the Ruabon Road. 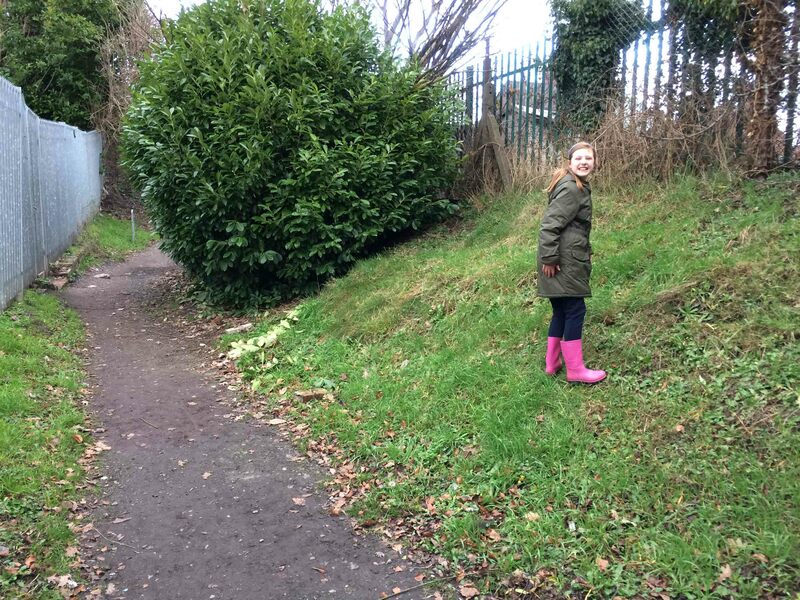 Alternatively, use the NT car park at the Woodland Classroom off Hafod Road, and take the path over the stream and up into Court Wood, taking the left-hand fork in the path. Take the left-hand path up into the Wood. Again, it is important to note the cluelessness of the National Trust signs, which mention the Wat’s Dyke Way, but don’t give visitors an explanation of where and what Wat’s Dyke was. Variously positioned under or within back property boundaries, a substantial and significant section, recently cleared of vegetation by NT volunteers, can be viewed in two prominent stretches. 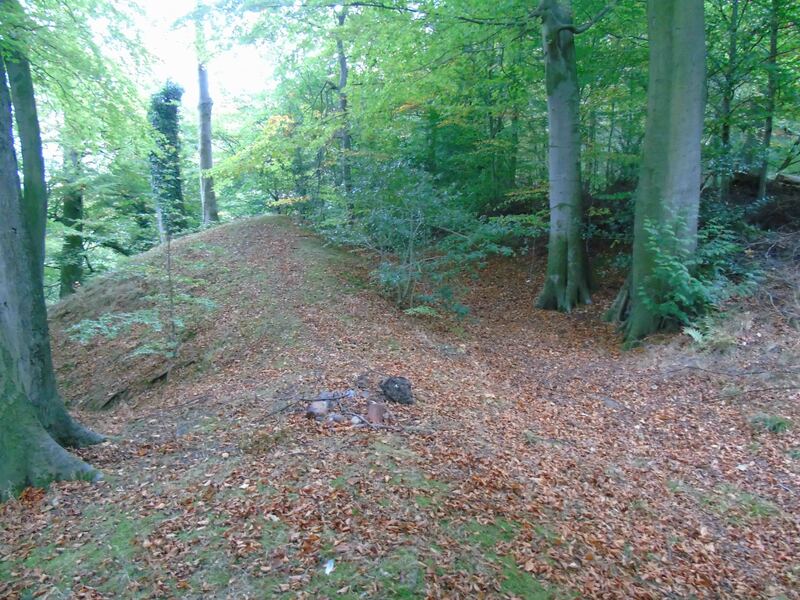 At the south-east end of the ridge, Wat’s Dyke is lost as it descends towards the valley and towards Erddig Castle. Presumably it once crossed the valley floor and I think there are subtle traces of it doing so. Park at Erddig National Trust car park or walk into the estate from Wrexham or from the NT car park at the Woodland Classroom off Hafod Road, one can see a significant section of Wat’s Dyke within the woods between Erddig Hall and Erddig Castle. See my discussion here. and here, and also here.